blend a cup of water with 8-12 ice blocks add 6 cups of greens -I used kale and choysum. Blend until the blended mixture comes up to the 4 cup line. Add a pear, 2 frozen kiwis and 3 frozen bananas/ lemon and lime juice and 3 stevia tablets- makes about 2 litres. 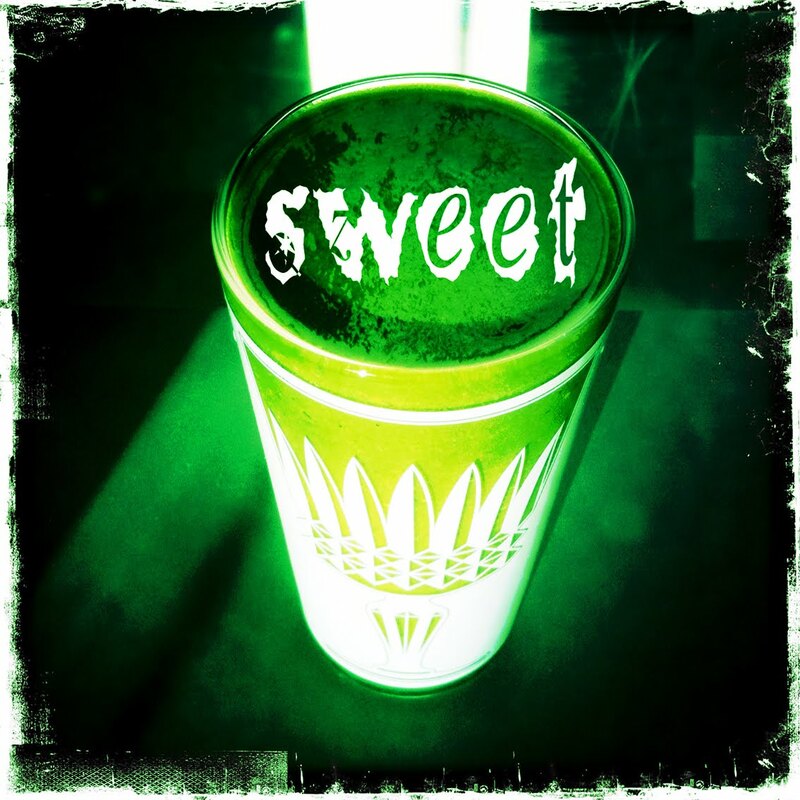 so how to make your smoothie sweeter- add some stevia, agave nectar, soaked dates or maple syrup. I know maple syrup and dates but the others? Stevia is an American native herb that is 30 times sweeter than sugar, has zero calories and has been used for centuries by North and South Americans. It has been used in Japan as an alternative sweetener since the 70′s. The reason most people haven’t heard of it and why artificial chemicals like aspartame and NutraSweet are used is because the FDA banned for some years production and importation and did not approve stevia for sale because of industry pressure- from the artificial sweetener companies and the sugar industry. You make more money processing sugar cane and stripping all essential vitamins and minerals from it and turning it into zero nutrient high calorie white sugar and also mixing up additives and chemicals in a lab and marketing this to consumers and food companies than you do growing a herb I’m guessing….though recently because of bad press re additives Pepsi/Coke look like they are moving to replace all artificial sweeteners with stevia. Reading the history of stevia (which involves FDA ordered book burning) is like reading political intrigue- someone should make a movie like The Insiders about this! As you may have noticed I love the history of food and food corporations and food marketing, advertising and production and cultural perceptions. You cannot separate food from the history of culture/ science/ health/ commerce/ economics/ law/ exploration/ geography and knowledge. Anyway if you need a sweeter less green tasting smoothie or just want to increase your greens into a smoothie that is drinkable you can buy Stevia in tablet or powder form usually from health food shops- if I need to I add 3 tablets (3 teaspoon sugar equivalent) to 2 litres of smoothie. I use SweetLeaf stevia, which is a rather pure form of stevia–without the sugars or sugar alcohols others may have. As far as I’m concerned, the FDA has absolutely no credibility. The story of corruption and politics that is the FDA probably would make a good movie! Who can we talk to about that?! H- thanks for that info. I’ll have to look out for it. I’m thinking that any money to make a movie about stevia and the FDA would not come from the mainstream film corporations. It would have to be an independently funded doco like Food Inc. Cannot wait for that to open here! Today I bought a stevia plant from the local markets! I planted it in a pot on the back deck. Really looking forward to seeing how different the leaves will taste compared to the white powder and the drops.